For the fourth summer in a row, I got to ride in a new country thanks to my wife's appreciation for the Urban Sketching Symposium. It's a great experience for us both as she gets to take workshops and sketch an exotic and interesting city while I ride. At the end of the day, we share our adventures - often over dinner with some old and new friends. For instance: simply approaching a woman sitting alone with a sketchbook at a restaurant in Rio allowed my wife and I to meet Rita Sabler of Portland, Oregon. The symposium attracts artists from all over the world, and a surprising number of people don't tag along with the artist they partnered with. Hopefully, that will change. Yes, non-sketchers: you'll have to listen to conversations about pens, ink and (gasp!) diminishing paper quality but trust me: it's well worth it as long as USK organizers pick interesting cities. And they have a good track record. Three years ago, the USK was in Lisbon, Portugal. The year after that, Santo Domingo, Dominican Republic. Last year, Barcelona, Spain. This year: Paraty, Brazil. These USK trips, from my perspective, share several common characteristics: Flat tires, a bad area map not drawn to scale, a language barrier, and of course, cobblestones. Cobblestones…why did it have to be…cobblestones. I thought my experience with the flathead screws of terrain would prepare me for Paraty. However, no amount of experience with cobblestones prepared me - or would prepare any seasoned cyclist - for the horror I saw on arrival. There's a fine line between 'cobblestone' and 'boulder' and Paraty, Brazil is sitting several miles into the 'boulder' territory. This is where cobblestones have been fed a diet of deep fried Twinkies and Chili's appetizers for generations. Either that or Paraty is where cobblestones go when they want to spend a semester abroad. My wife tried to comfort me by explaining the town center of Paraty - which is where Cobblestones 2.0 were located - doesn't allow cars. I was sure it was because one too many Kias had fallen sideways between the stones and gotten wedged. Aron Ralston - who continued mountain climbing after his self-amputation after having his arm pinned by a massive chockstone - would probably take one look at old town Paraty and turn back saying "Whoa, no way! This place gives me the willies." If roads paved with rocks larger than some of Jupiter's moons wasn't enough: the town floods at least once a month. Paraty is just about at sea level in the first place, and the high tide comes in through special openings that were put there so six to ten inches of seawater can get in. During these periods, a new level of difficulty in getting around town is introduced. When the tide recedes, it apparently takes with it all of the people who fell between the mutant cobblestones and became trapped - as well as act as a crude cleaning system for the streets. Sketchers were advised to bring hiking boots. They should have each brought a moon buggy (I found out at the end of my first full day of riding that several sketchers, including my wife, had to flee the rising floodwaters. I only wish an artist had immortalized the scene in a watercolor). 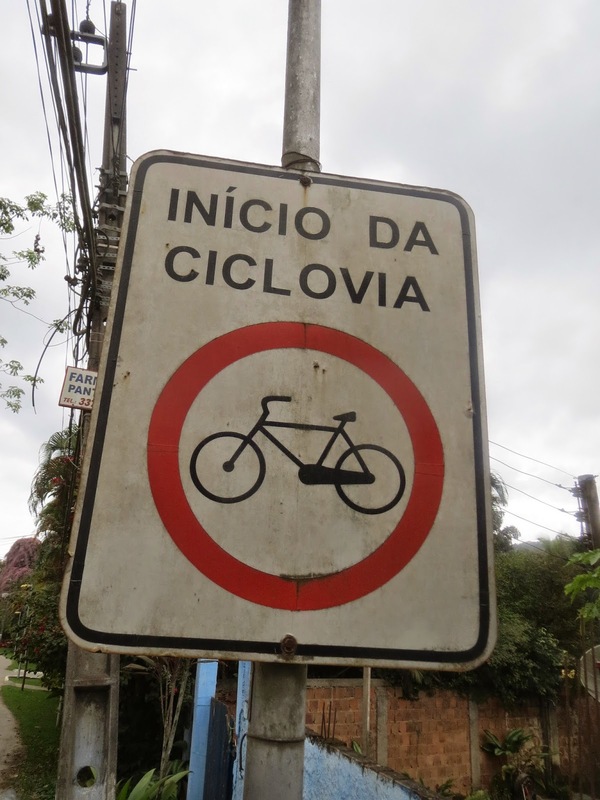 As unwelcome as the center of town looks, I have to say that paradoxically, Paraty is a biking city. Like Delhi, India, in the center of town I saw heavy, big wheeled bikes. Next time, I thought, I'll bring a suitcase full of Cane Creek Thudbuster seatposts and make a fortune selling them. When you get to the main thoroughfare, you'll find a huge number of men and women biking as well as three bike shops not more than three-fourths of a mile from each other. That's always a comfort for any bike traveler. After all, even if you don't speak the language, there are shapes that don't need any translation. Paraty Tours - the same company my wife and I used to take the five hour van ride from Rio to Paraty - offers rental bikes and tours. I had no need for a rental bike since I had my Bike Friday New World Tourist but I borrowed their tour maps - where I saw something most unsettling. I'm used to maps not being made to scale, but the fact that the designer selected a full-suspension mountain bike with knobby tires to represent bicycle made me worry for my skinny, 115 psi road tires. If you pile mistakes on top of each other, give 'em a polish and photograph them in just the right light, you get wisdom. Everything that went wrong on previous adventures fed into this trip: I brought no fewer than four tubes. Thanks to the embarrassment at Barcelona, I made sure to buy new patch kits days before the trip. And just due to general annoyance: I brought along the frame pump that came with the 'Make Offer' bike I bought in New Hampshire (that has since been built into a city bike) to make inflating the tires less difficult in the first place. I hoped I only needed one hand to count the number of flats I was sure to get here. For this trip, we stayed at Pousada Pontal Gardens, a lovely bed and breakfast not far from where the picture above was taken. See the bike path on the far right? That was exactly where I tested out the New World Tourist to make sure it had survived the flight from New York okay. I wasn't even ready to start my first full day of biking and I was already grinning: Brazil was now on my list of places I've biked (and it was a new continent for me, too). As you can see, the bike path stretches along the waterway and points toward a mountain in the distance. You can see it there making out rather aggressively with the cloud. After only going a few miles, I was confident I was going to have fun here. I had three days, and as there were only three roads out of town I decided to explore each one. While my wife (who has posted her sketches on her blog, SUMACM.COM) and the other USK sketchers were going to sketch the center of town, I was going to pick a road and put as many miles between me and those mutant cobblestones as possible. (Click here for Part II).